I was at Dollar Tree last week scoping out some Valentine's Day decor and getting my usual things: salt & pepper grinders, pop-up foil sheets, drink mixes to add to bottled water, and batteries for the Wii remote. While I was there, a solid black plate caught my eye. (can y'all believe I forgot to take a pic of the plate before I wrote all over it?!) I had just purchased a gold paint pen at Michael's, and I knew I could jazz this plate up! A few minutes later, I spied this candlestick holder on the candle aisle and I knew they were meant to be together! It's gold with black splatters - perfect for what I had in mind now! 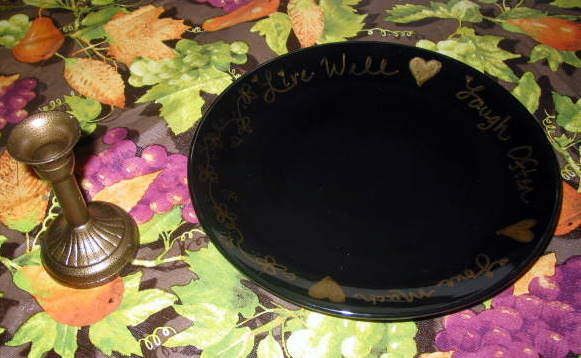 At home I wrote one of my favorite quotes "Live Well, Laugh Often, Love Much" around the plate with the gold metallic paint pen. At the bottom I added a bunch of doodled flowers and hearts. Then I grabbed the brush-on super glue and here's the final result! 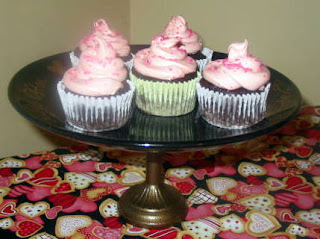 Total spent: under $5 for a super-cute dessert stand! It's going to get a lot of use here!! I love this idea. I have seen similar creations before and I am itching to make my own. What a neat idea... 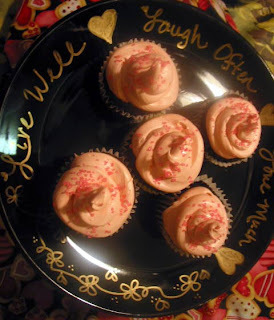 I love that you wrote on the plate. I really need one of these (or several) as I currently obsessed with making cupcakes. Thanks for sharing your brilliant idea! I love the dollar store! Great stuff there. Nice job! Hop on by when you get a chance! Oh my gosh what a fantastic idea! I am so going to steal, err borrow this! It looks fantastic. I wonder if you used a short candlestick if you could use it as a cakestand? Cute! Love your writing by the way! If I had free handed you might not be able to read it! Awesome job! You have a great eye for seeing the potential in things Plus - I'm so impressed that you wrote on it yourself! I'm so afraid of "messing up" Love it! Thanks Jen & Mimi! I just took a deep breath and went for it. It isn't perfect, but it turned out fine as far as the handwriting goes! I really do love it! Really good week at Publix !